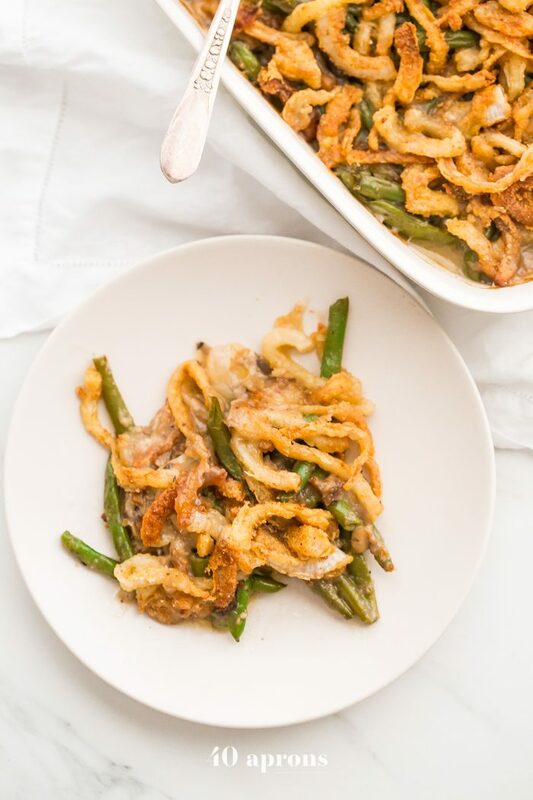 This Whole30 green bean casserole is just like the classic Thanksgiving dish: tender green beans in a rich cream of mushroom sauce, topped with fried onion straws. 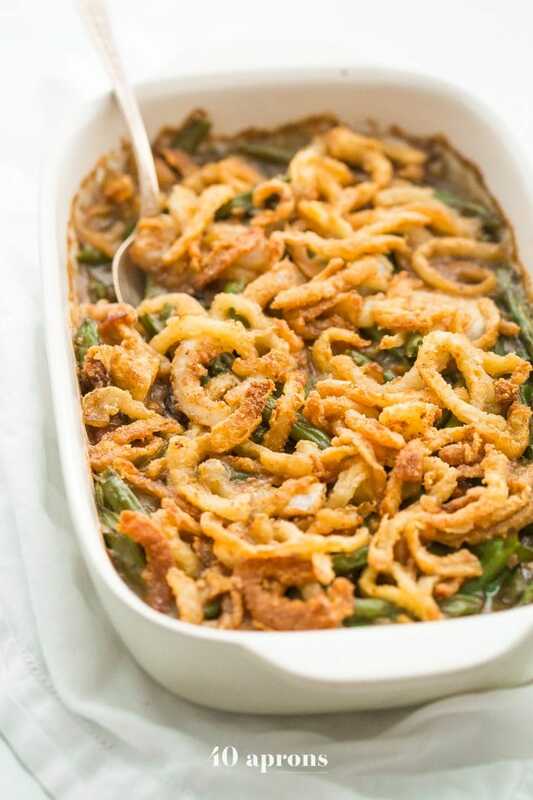 This Whole30 green bean casserole (also a paleo green bean casserole, of course!) is an absolute must for the Whole30 Thanksgiving table. 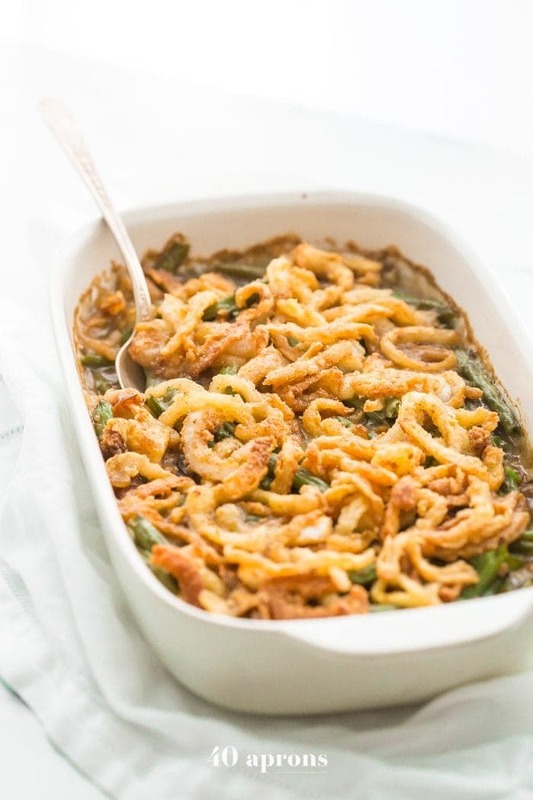 And to be honest, this paleo green bean casserole tastes even better than the classic version! What does your Thanksgiving plate look like? I feel like Thanksgiving plates are some sort of gluttonous, culinary DNA, different for everyone and perfectly representative of one’s personality. I’m still working on my theories distinguishing introversion and extroversion as evidenced by the application or avoidance of burnt marshmallows on one’s sweet potato casserole, but when I nail it, y’all will be the first to know. But really, my plate is easy: dark meat or very tender breast and tons of gravy, stuffing and tons of gravy, cranberry sauce, and far more than my fair and proportionate share of the green bean casserole. Hey, I made this, and I’m gonna eat as much green bean casserole as I damn well please. It’s strange to me that, given how much work I put into Thanksgiving every year, making every single thing from scratch, the one dish that comes from cans is one of my favorites. 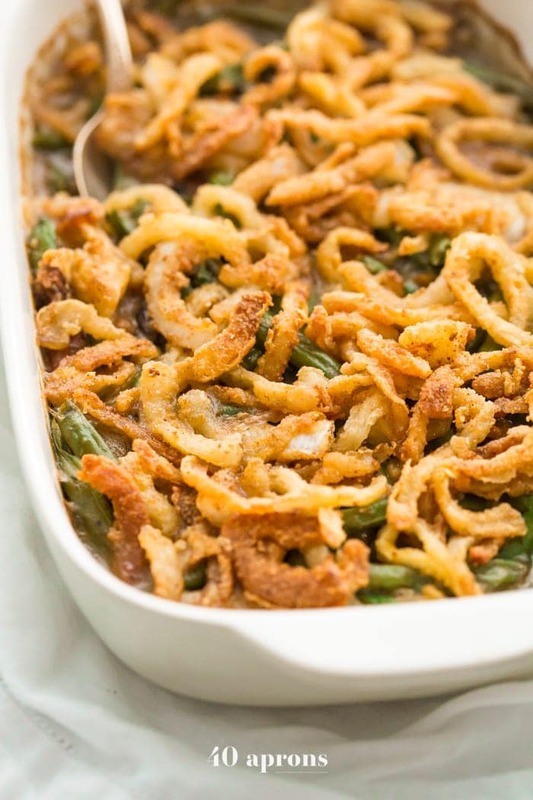 I don’t think I’m solo here, though: the canned green bean casserole is a national phenomenon, gracing every Thanksgiving table worth grazing (in my opinion, that is), the perfect blend of tender green beans and creamy, rich cream of mushroom soup, topped with sweet, crunchy onions. I even remember coming home after a party one night in college and making a batch to eat with my friends. Green bean casserole after being way overserved around 2 a.m.? Yeah, that was me in college. The me-est thing I’ve ever done. So this year, as part of my Whole30 Thanksgiving recipes series, complete with a brined herb butter turkey breast and gravy, Whole30 green bean casserole, Whole30 sweet potato casserole with pecan-date topping, and Whole30 cranberry sauce (with my Whole30-compliant paleo stuffing already up on the blog! ), I had to make my own take on the Thanksgiving classic with no grains, no gluten, no dairy, and no sugar. And it. is. perfection. I didn’t skimp on any of the elements, making a cream of mushroom soup and onion-petal style crunchy fried onions to top the whole thing. I used fresh green beans, but you can use frozen, too. Basically, it’s a Whole30 Thanksgiving recipes must. Make the cream of mushroom soup: In a large saucepan, melt ghee. Sauté mushrooms and onion for 5-10 minutes or until softened. Add garlic and stir for 30 seconds, stirring constantly, or until fragrant. Deglaze the pan with 1/4 cup chicken broth (or white wine if not on a Whole30) and bring to boil. Add in remaining 1/2 cup broth and salt and return to a boil. Boil for 3-5 minutes then sprinkle in arrowroot, whisking vigorously to combine. Continue cooking until reduced by about 1/3 or 1/2. Use an immersion blender (or transfer about 2/3 to a regular blender and blend 'til mostly smooth) to blend until mostly smooth. Add in coconut cream and whisk until smooth. Make the fried onions: In a shallow dish, add your egg. In a second dish, place your tapioca flour. In a third dish, combine your almond flour, garlic powder, salt, paprika, and black pepper and whisk to combine well. Dip onions into eggs, then shake off excess. Working in batches, add onions to tapioca flour and toss to lightly coat, shaking off excess. Then coat onions in almond flour mixture. Heat a skillet over medium to slightly medium-high heat and cover the bottom of the skillet with oil. Fry onions in batches for 2-3 minutes per side, being careful when turning so as not to disrupt any coating. Remove from skillet and drain on paper towels, then sprinkle with a bit of salt. 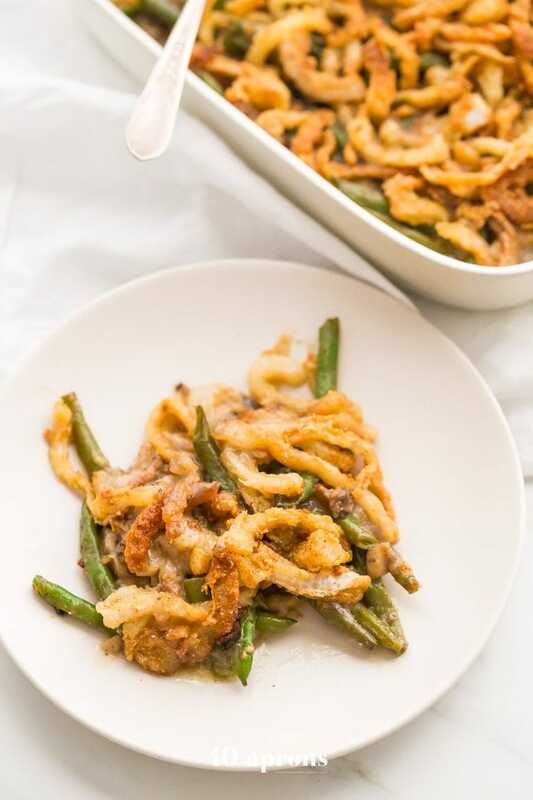 Make the Whole30 green bean casserole: Steam the green beans until bright green and crisp-tender. Transfer to a 3 quart baking dish and stir in cream of mushroom soup and 1 cup of fried onions, stirring gently to combine. 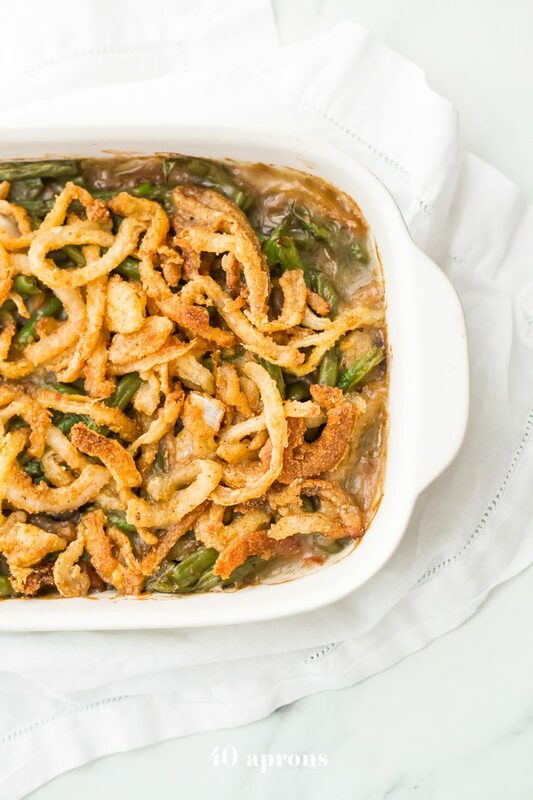 Bake at 350º for 25 minutes then remove from oven, top with remaining fried onions and bake another 10 minutes. Let sit 5 minutes before serving. I made this and loved it! My whole family thought it was great. The cream of mushroom sauce and fried onions were incredibly delicious. It took a long time and used a lot of dishes, but it’s worth it. Thanks for the recipe. It’s a keeper. Just made this–am eating a forkful as we speak! It’s excellent, though the coconut cream is a bit too strong for my taste–it smells very much like coconuts cream, and that peculiar taste kind of invades each bite. I also added 1/4 cup more chicken broth because it reduced IMMEDIATELY when I added the arrowroot powder and became a sticky glob, so the chicken broth helped thin it a little. Definitely recommend this, though please let me know if anyone discovers a better alternative for coconut cream! Where do you find cashew cream? Do you think this can be made day before? If so how woukd you do it? 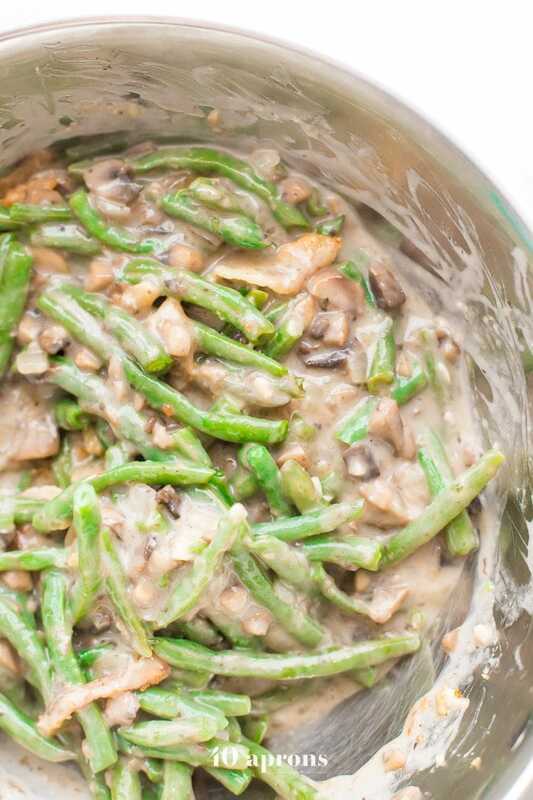 I wouldn’t recommend making the whole thing ahead, but you could make the cream of mushroom soup ahead and steam the green beans. Then make the onions the day of, assemble, and bake!